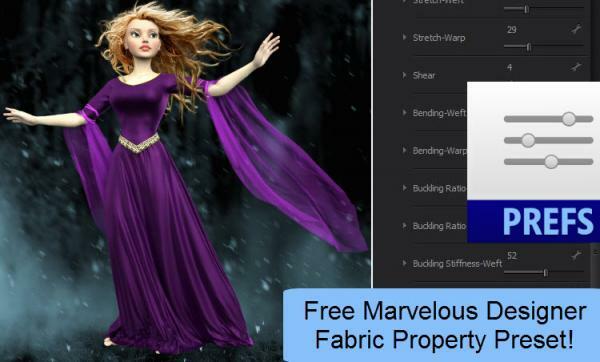 Download a free Marvelous Designer fabric preset from CG Elves. This Marvelous Designer fabric properties preset creates soft hanging material perfect for skirts, dresses, sleeves, silky scarves, and light capes. This Marvelous Designer fabric preset was used in the example image for the skirt and sleeves. What is a Marvelous Designer fabric preset? MD fabric physical properties presets control how cloth hangs, drapes, simulates, and animates in the Marvelous Designer software. To create realistic 3D clothing you need to have realistic fabric presets. Would you like to have a huge library of Marvelous Designer fabric presets for every type of clothing you need to make?